and check it out we would love you to join in .I have used one of her images so i get two chances to win . This is a cheery card. Very, very pretty. SImply gorgeous darling!!!!!!!!!! LOVE IT! Certainly puts me in a CHEERY mood. 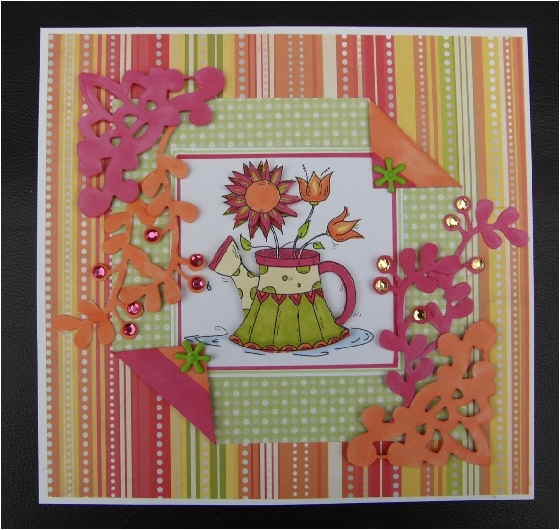 Thanks for playing along in the Sassy Cheryl's Bright and Cheery challenge this week at Sassy Cheryl's. I adore this card. The coloring is beautiful on the watering can, and that with the fabulous papers and sketch make for one HAPPY card. Fairy, this is fantastic! love your wonderful coloring and all the great texture and lacy die shapes. A breath of spring in the middle of winter! thanks for getting sassy with us this week gf!